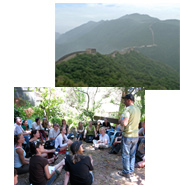 Our comprehensive programs are designed to educate students in the history, view and application of Traditional Chinese Feng Shui (TCFS) as preparation for professional practice in the modern world. Students who choose to specialize in feng shui exclusively are able to begin work as confident practitioners and launch their businesses upon graduation. Alternately, professional architects, interior designers, and practitioners of Chinese Medicine find that feng shui deepens their existing practice and enhances their professional appeal. 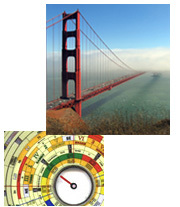 To this end, Golden Gate Feng Shui School (GGFSS) has developed a refined education model with courses on classical feng shui principles of form and compass school, astrology, architecture, design, professional practice, and self-cultivation. This curriculum encourages both practical and esoteric thinking, which builds with each new trimester in depth and breadth. At GGFSS, we feel it is important that students be steeped in the tradition and cosmological world view that is feng shui's origin. The full immersion in the study and practice of classical feng shui engages students in profound personal and professional growth. We offer, without question, the finest course of study available in the world today. We are the only school to supplement in-depth training in TCFS, with internships, business coaching, facilitated site visits, hands-on natural building, study groups, and an online community to stay in touch between classes. We are the only feng shui school in America that operates as a full-time educational institute and teaches a contemporary approach to classical feng shui, which has been developed in Asia over the past 3,000 years. Classical includes both the Form School and Compass School. Our integrated curriculum provides students access to the tenets, techniques, and applications of this comprehensive and respected tradition. Feng shui can create harmony for individuals even in a hectic, fast-paced, modern world. We teach with a current sensibility - translating traditional design principles so they can be applied effectively to contemporary homes, businesses, and people. We also delve deeply into the budding “natural building” industries and examine the true meaning of sustainability, natural building, and environmental and human health. Our curriculum is designed for maximum accessibility. Classes take place at our location in downtown Oakland, California. Classes take place three days per month, and the specific time commitment depends on the student's chosen program. We are always willing to work with varying schedules and time commitments. This is one of the few schools in the country that actively prepares students to conduct live consultations and that offers business building classes integrated into the curriculum. Graduates leave our program ready to work—as a feng shui consultant or incorporating feng shui into an existing career path. Golden Gate Feng Shui School was founded on the belief that feng shui is a beneficial practice, for humans and for the environment. It fosters respect for the planet and creates health, beauty, and harmony. We believe these qualities should be shared with as many people as possible, in as many homes, offices, and public spaces as possible. Our training empowers you to take this work out to your community or client base and create an ever-widening ripple effect helpful change. Whatever your current profession or level of experience with feng shui, I encourage you to join us in our mission. We look forward to providing you with an educational experience that can change your career and your life.